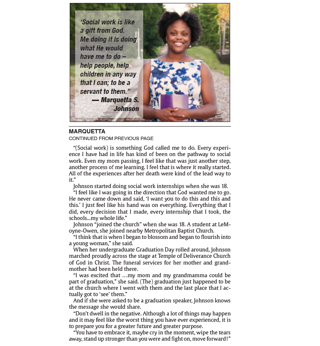 Marquetta Johnson Featured in Tri-State Defender! 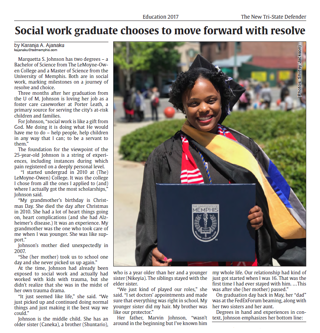 Marquetta Johnson, one of Porter-Leath's Foster Care managers, was recently featured in the Tri-State Defender! Marquetta makes a difference each and every day through Porter-Leath's Connections program and ensures that foster children in Porter-Leath resource homes have every thing that they need to succeed. 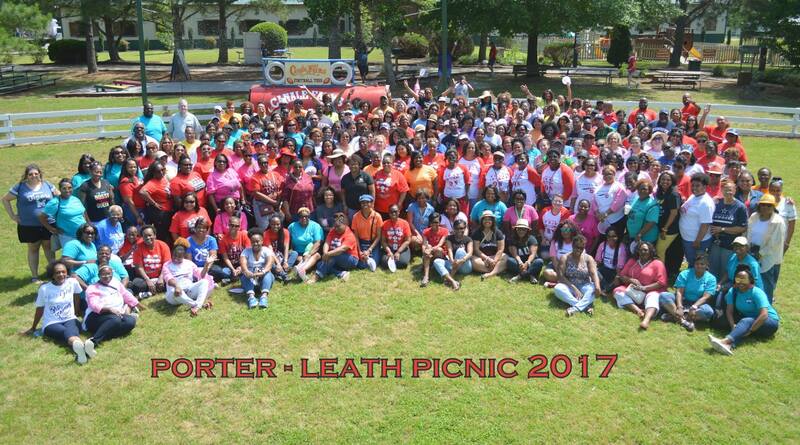 If you have a heart for serving children and families, Porter-Leath is the place for you! Start your dream career on our Opportunities section. How did you learn of the job opportunity at Porter-Leath? I saw it in the newspaper, and that’s been, probably about 14-15 years ago. What drew you to Porter-Leath? I had always worked with mentally challenged children, and I wanted to get a feel for working with juvenile children. What drives you? What is your personal mission? The challenge in working with the children. Trying to be there for them, whether it’s emotional, or that they can come and talk to me and tell me what’s going on with them, that’ fine. Just try to be pretty much like a mother figure. What’s the best part of being a Residential Monitor at Porter-Leath? Working with the kids, and then my co-workers. I like it. Sometimes when I get off, I’m still here. Maybe if a situation is going on, or something with a child, I’m still here trying to assist, or just talking to my co-workers because we don’t get to see each other like that. Why should someone be a Residential Monitor at Porter-Leath? To come to Porter-Leath and work, the environment is good, I mean we have some challenges sometimes working with the children, but that comes with the job. So if you’re not here just to be here about the money, and be here for the child and the child’s needs, that’s it right there. Just being here for the child. How have you been successful at Porter-Leath? I’ve been successful because I’m still at Porter-Leath! And, that’s enough said on that. You know, I’ve been successful for being here, and I just like what I do. Where go you want clients to be in 20 years? Most of my residents that we have here, I want them to be back with their families if possible. And if not, I want them to be somewhere where they have learned from being here at Porter-Leath, and say, “Hey, I was there” and pass it on to some other child that has challenges going on with them. Giving back - I want them to be giving something back! What is your obligation to the Porter-Leath children and families? My obligation to children and families is to number one make sure that they live in a safe environment, make sure that the staff that service them from Porter-Leath is competent, professional, and has a high level of compassion to assist them to operate at their optimal level. What impact does your staff make? Providing the services needed for them to function as a family in the community with the least restricted environment. The impact is great as far as helping them to succeed in their individual and family goals. What do you look for in a Case Manager? The type of individuals that works best are individuals that are passionate about what they do. They’re also compassionate to the clients that they serve. They also have a vast knowledge of human services, social work and some counseling skills, that they have a high level of ethics about them, that they practice integrity on a regular basis. How do you lead your staff to achieve goals? I lead my staff to achieve their goals by first of all making certain that they have the resources and tools that they would need to have in order to be successful with working with families. Also, I lead my team to success by being willing to roll up my sleeves to help them in areas that they need help. What’s the biggest reason someone should work at Porter-Leath? Number one, there’s always room for opportunity. Two, we have a family, very cohesive environment among the team members. The third reason is if you wanted to help youth, Porter-Leath would be the ideal place. After all, Porter-Leath is the oldest agency in our community. Define success for your team. Success for my team would be for each family that we serve, they would be reunited with their family. 100% of those youth will return back home with their caregivers. 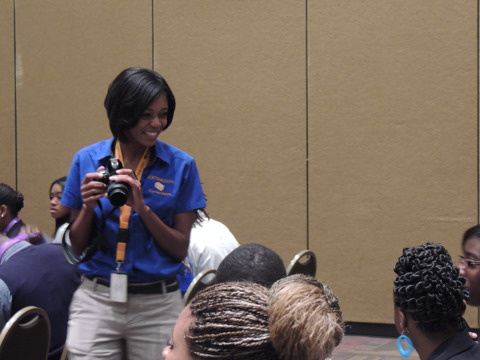 When I started as an AmeriCorps member, I could tell that everyone was there to assist. I’ve always felt like Porter-Leath has been a family to me, and just a place of growth. I started here, and this is where my career was, and I wanted to transition within this agency, which is why I applied and I’ve been successful to achieve those goals. But I definitely will say this is where I want to retire from. I love being here. What is your obligation to Porter-Leath children and families? My obligation to children and families is ensuring not only that they are school ready, but that we are meeting the needs of the families for resources - just meeting their everyday needs. What do you look for in a new staff member? As a leader, I look for the characteristics of a staff person going into any role or any position such as teacher, assistant teacher, family service worker, building engineer, cook - that they have a commitment to the core job that they’re going to perform - that’s working with children and families, that’s either direct contact or indirect contact with families. We’re looking for someone with longevity - someone that career-wise will work within our agency and within our program. I lead my staff to achieve their goals, one by meeting with them one on one to help them complete their goal statement as to what they want to do, what they would like to accomplish. This is where you are, and this is where you’re trying to go. I provide them with resources. We meet and we talk about it - I’m interested in it. You know, “How did the test go?” “How was your class last night?” When they know that I’m invested in not only the everyday here but in their overall goals or their future. How have you grown as a leader at Porter-Leath? I was an AmeriCorps member for one year, and I transitioned to the Program Supervisor for AmeriCorps, and I transitioned to the position of Assistant Site Manager at Delano under Ms. Brenda Milligan, and so I applied for Site Manager role at Martin Luther King Head Start, and now I’m transitioning to the Academy - the Early Childhood Academy, so I would say definitely different roles, but still the same core values. If I had to define the word ‘success’ for my team, I would say, a group of people that want to be and want to do what they’re doing everyday. Client results. I would say we have families that come in all the time whose children have gone through our Early Head Start and Head Start programs that are achievers, and it started with Head Start. It started with Early Head Start. It started with our core programs. Our staff makes a major impact in the lives of our families. I have a background in social work. I first used to work with the Department of Children Services. What drew me here is because I have an opportunity to work with children and families again in a different type of setting - and school, because I like teaching and I like education, so it goes hand in hand. What’s the best part about being a Family Service Worker at Porter-Leath? One of the best things about being in Family Services at Porter-Leath is that you get to see all areas of children’s stages of development. I started out in Early Head Start, which has babies from 6 weeks to 3 years old, and then you go from 3 years old to 5. And you get to see their cognitive skills, you get to see their emotional skills, and social emotional skills. So that has been really really good to see them from not talking, to talking. Why should someone be a Family Service Worker at Porter-Leath? Being here with Porter-Leath, there’s a whole lot of resources. With the services that have been given through Head Start, it helps the family. It can help any other family members in all parts - with needing transportation, ways to find food, resources outside of the norm. I’ve been successful here at Porter-Leath because I’ve been able to move around. I went from Early, to Head, and I’ve been really successful as far as being able to reach parents, recruit parents, getting their children enrolled and getting them resources and helping with jobs, connecting them with the right people. So that has really really been a success for me. What is your personal mission? My personal mission is to see people succeed. To develop an open relationship with them and for them to be successful. And give them the truth in what it is. The life they are living and the thing that we do - it’s not play. This is real. And we have children that are watching us so we have to build a firm foundation for them. I learned about the job opportunity at Porter-Leath through the internet. I was willing to relocate at the time, and I was searching the Memphis area for jobs in the area that I was working, and I came across Porter-Leath. I had a couple of friends that worked for Porter-Leath at the current time, and I did a little research and I saw that Porter-Leath values the same things that I value. I had to go back to school and get my degree in Early Childhood Education, and so I’m here teaching. What drives you to teach? What drives me to teach is the children. Teaching is a passion, and I love to see the growth in the children. I love it, I love touching the families and the community. What is the best part about being a teacher at Porter-Leath? I love the atmosphere, I love the teachers, I love the children. I love my coworkers, I love the agency as a whole, because what I represent, Porter-Leath represents too, and that’s determination, motivation, togetherness. One goal, one team. What does it take to be a teacher at Porter-Leath? Values, integrity. You have to be considerate towards the children, the babies, the families. They have to feel welcome. They have to feel warm. You have to observe children. You have to watch them and keep your eyes on the children at all times. Why should someone work as a teacher at Porter-Leath? Well the agency does offer opportunities for advancement. 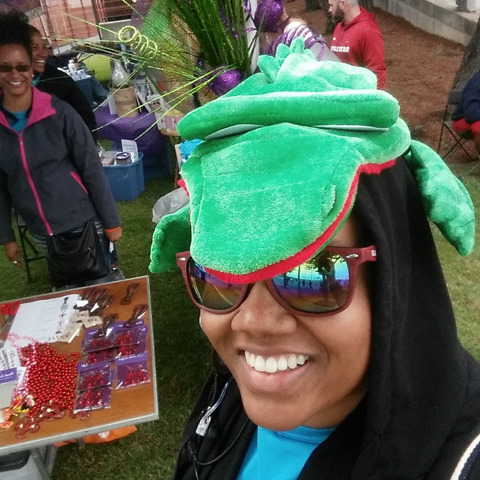 Volunteering - I love participating in the Crawfish Festival. I was nominated for Make A Difference. I know my job and I know how to step in. To learn all I can learn about history, and about children and families, and how to serve them best. What made me work at Porter-Leath is the mission, and the ability to work with the children. I got a Bachelor’s degree in Education at the University of Memphis, and I also have a degree in Sociology. At Porter-Leath we deal with children that come from different socio-economic backgrounds. So being here at Porter-Leath, it allows me not to just look at my one child in my one classroom, but to look at the child in my classroom and the child and their family and how they fit into our culture and our society - not just strengthening that child but strengthening our whole society. What’s the best part of being a Teacher at Porter-Leath? The best part of working at Porter-Leath are the children. I love my children! What makes your classroom shine? I think the wow factor in our classroom that shines the most is the energy behind our children. I think from the minute you walk in our classroom, the vibrant atmosphere behind our children, the tenacity behind their work. We have a catch phrase in our classroom - my children say “ I did it because I can.” And it’s because my teacher and I tell them you did it not because you did it, but you did it because you can. You have the ability to do it, therefore you did it. Why should someone be a Teacher at Porter-Leath? I think that people should look into being teachers at Porter-Leath because of the opportunity to work with the children. Especially if they have a passion or a drive for working with families. It gives you the opportunity not just only to work with children, but also to look into working with the needs of the total family. I’ve been most successful with Porter-Leath. I graduated from the University of Memphis in 2015. I was hired with Porter-Leath in August. I was promoted to Lead Teacher in May of 2015, so I think I’ve been most successful with my promotion in less than a year’s time. What does it take to succeed as a Teacher at Porter-Leath? To succeed as a Teacher at Porter-Leath, it takes passion, determination, drive, effort and a heart. You have to be able to love. In Sunday School, my church member would always talk about Porter-Leath, Porter-Leath - that she loved working for Porter-Leath. What is the best part of being a Case Manager at Porter-Leath? The best part is that I get to meet different children and I get to meet different workers throughout the state of Tennessee. What do clients need from you to succeed? My clients need a listening ear, and just support. In 20 years, I would like them to be actually be successful in a career, have completed college and actually have a great job. I’ve actually been successful at Porter-Leath. I’ve actually been here for 3 years and I know most of the systems, so I get a lot of questions about how to do this, and how to do that. The number of children that we serve has actually increased, and that we’ve had several success stories as well. Why should someone be a Case Manager at Porter-Leath? What drives me is being able to help. I have one achievement with one female resident. She actually went off to college. She started at Rust but she ended up going to Mississippi State. As long as I know I’ve actually reached out and been able to make a change in someone’s life - one child’s life, I know that I did my job. My obligation to the children and families is to make sure that they are provided all the services that the organization has to provide them. One impact that we make specifically to our parents is to assist them with whatever goals that they have set to accomplish. Those goals may range from going back to school, getting a GED, ensuring that they get a job by a certain time; and we assist them with whatever financial issues that they may have, or financial concerns that they may have by referring them to resources. What do you look for in a new employee? I’m looking for someone who’s going to come on board and be a part of the team by making sure that they are a team player. We work as a team, we provide services as a team, and we make sure that the site as a whole remains in compliance. How have you grown as a leader? I feel like I’ve grown because I’ve made a difference in the staff that has been placed under my leadership; and I smile a lot when I talk about my staff - they are valued here. They are the asset to this organization as a whole. I’ve been successful at Porter-Leath because I’ve had great management. I have a lot of skills and I have a lot to offer, and they give me the opportunity to offer my skills and my expertise. We talk to our children and our parents and we let them know you can be whatever you want to be. Success is knowing that we’ve made a difference in the lives of the parents and the children that we work with, and specifically our children - making sure that they are school ready. We have school readiness goals and those are the goals that we work on. Once we provide those services, that’s the success that we look for - that the children are ready when they leave Porter-Leath. What did you want to be when you grew up? I actually wanted to be a pediatrician, but I felt more passion with working hands on, and actually teaching children different skills, and being creative. I actually did an online search. When I entered my information, Porter-Leath popped up, so I actually looked up Porter-Leath online, and that’s when I said, “okay, I need to go ahead and submit my application,” so I did that online. The best part of being a teacher at Porter-Leath is I get to see smiling children every day. You have to have good communication skills and that passion and that patience. Patience is one my biggest things, because when you have that down time with just that parent and that child, you can build on that relationship. I think I’ve been successful at Porter-Leath because I’m able to do what I love. Everyday is something new. Give them that quality time, because even with us having those 8 kids, you still have to have that individual time with that one child - it builds that security - that blanket to say “okay, I know I can trust you”. When the teacher actually gives that care, it makes the child feel good, and when it make the child feels good, it makes the parents feel good that they know they trust that teacher with that child. “You wanna take ‘em home with you?” “No, I can’t take em home with me.” But I really love what I do. I actually came from another facility, and they opened up a program here. What is the best part about being a Residential Monitor at Porter-Leath? The best part of being a Residential Monitor is actually getting to help the kids. Most of the kids, sometimes you’re able to help them - you get a good feeling when they call back up here and tell you “I’m actually doing good, I’m in school,” or “I’m working,” or “I did this” or “I did that.” It’s just a good outcome as far as being some positive feedback from the kids that you actually helped. What makes you a successful Residential Monitor at Porter-Leath? I pretty much just stick to the script. Whatever policies and procedures we have in place, I pretty much just follow whatever the guidelines are. What do the children you serve need from you to succeed? You’re having to always encourage them to do the right thing, because with them, they’re saying to go left at times, you’re going to have to steer them back the right way. So you’re going to have to always be an achiever, you’re going to have to always be someone who can guide them in the right direction. You have to be able to relate to them at times. Once you relate to them, you’re going to build a good rapport with them. Once that rapport comes about, you pretty much can get them to do pretty much anything you ask them to do. My personal mission is to see them succeed in life. What does it take to succeed as Residential Monitor at Porter-Leath? In order to do this here, you’re definitely going to have to have some type of training as far as CPR, because you have to have CPR in order to work with kids just in case anybody passes out or anything like that. When they’re kind of getting defiant, you might have to go “hands-on” when you’re actually dealing with them - so those are the types of tools that you actually need, and you’re going to have to have other types of skills also. Why do you enjoy working at Porter-Leath? I actually like the atmosphere here at Porter-Leath. It’s not a job, it’s really not like a job, it’s more like a family actually. As I was growing up, I wanted to be a teacher, and a social worker, so I’ve taught, and now I’m here. What drew you to Porter- Leath? What drew me to Porter-Leath was the transition from Shelby County Government to Porter-Leath, and I am extremely thankful for the transition. What is the best part of being a Family Service Worker at Porter-Leath? The best thing about being a Family Service Worker is you get to meet the parents first. You get to meet them where they are. And then, at the end of the program, you get to meet them where they are again, and your hope for them is that they have grown. I am the person on the other side of the desk that has their best interest at heart. My goal is to see that they succeed while they’re here at Porter-Leath. 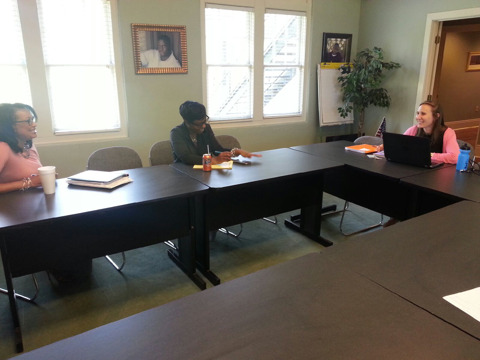 What does it take to succeed as a Family Service Worker at Porter-Leath? Someone should be a Family Service Worker here at Porter-Leath if they are in the business of helping others. If you’re not driven, you can’t drive anybody else. If you’re not successful, you can’t help someone else to become successful. As a Family Service Worker, you have to have those characteristics if you want to assist and help others. The communication is extremely awesome here at Porter-Leath. Personally, during my tenure here at Porter-Leath, I have grown as a person. I’m more outgoing, forceful, and I feel comfortable in helping people to become better people. I would pass Porter-Leath taking my child to school, and I noticed the sign, and I went home and I Googled Porter-Leath and saw that I could serve the agency with my background and my educational skills that I’ve acquired. What’s the best part of being a Case Manager at Porter-Leath? I think the best part about being a Case Manager at Porter-Leath is meeting so many young children, and just knowing and seeing the potential that they have. You’re not just pushing papers, or filing or doing paperwork, but these are actual lives, and what you do or say to others and to these children and their families could either make or break them in ensuring them that they are not their circumstances and they can overcome - just to use whatever trials that they may be going through to better themselves in the long run. The thing that my clients need from me is more of an emotional support, consistency, being present, being able to validate what they’re feeling, their fears, and not being judgemental when they do act out those feelings when they’re not able to articulate. We just have to be cognizant of what we do and really love our job and serve our clients with a purpose. The one thing that I like about being a Case Manager at Porter-Leath is supervisors and leaders who are very knowledgeable . We meet regularly through staff, our cases, just to get feedback on what we can do better if there’s anything we can do better to reach a common goal. What do you want your children to become in 20 years? Productive citizens. Building communities, and helping somebody else the way that they were helped. Just using their story to let somebody else know that they don’t have to succumb to their situation. I have to admit that I was a little intimidated when I was told to memorize the mission statement on my first day of work. What I didn’t realize at the time was the degree to which Porter-Leath staff embodies the agency mission, vision, and values day in and day out. These days, most organizations and agencies boast that they’re “data-driven.” While I may have a biased view, from my perspective Porter-Leath is not only data-driven, but more perhaps more importantly, uses data to be value-driven. Given my role to work with staff to identify ways to improve processes and outcomes, I have the opportunity to see their passion for enhancing the services that are provided to families and children. It may seem that analyzing numbers, inputs, and outputs is a pretty dry job. The truth is that when discussing data with Porter-Leath staff, the conversation always comes back to understanding how programs and services can be optimized so that our children and families experience the greatest benefits and so that we can best use our resources. Whether staff is trying to identify resources that can be provided to parents to improve children’s skill growth, develop a plan to safely reunite youth with their families, or recruit top-talent so that Porter-Leath families can be provided with the greatest support - the process, outcomes, and work-in-between are consistently connected back to the agency mission, vision, and values. Frankly, I’ve never met more passionate, genuine, hard-working individuals until I started working at Porter-Leath. My journey of discovery started with my hire date - April 1, 1999 - that’s right on April Fool’s Day! Not knowing exactly what to expect, only that there was work to be done, I squared my shoulders, put a smile on my face and remembered every lesson from home, school and other work experiences then got down to business. This was an opportunity to be a part of what makes my community a special place and where you get a chance every day to be a solution to a need. My work day is not about me but about others. When you hear the phase “there is no I in team” it rings true here at Porter-Leath. Don’t get me wrong you are recognized for your hard-work, creativity, dedication and drive to making our mission and vision realized. This is also a place where you get the support and are energized to keep working for the betterment of children and families. I may not see a child or family receiving services at Porter-Leath on a daily basis, but I get to “see” them through the eyes and ears of my team members. I am here for many reasons all of which boils down to one thing: I am here because this is where I am supposed to be. While growing from 75 employees to over 600, we are still the Porter-Leath as when I first entered the door over 18 years ago. Only now there are more of us to live out the Mission, Vision and Values. Porter-Leath has been my work home for almost six years, and in that time I have realized I have been fortunate to witness client successes, company growth and progress. I often interact with employees from multiple departments by participating in volunteer activities and site visits. Porter-Leath provides many opportunities for staff to give back while they are working, which brings a greater sense of meaning to the Values, Mission and Goals. Being able to volunteer in the biggest and best festival in the city, the Rajun Cajun Crawfish Festival, has to be one of the main reasons why I love working for Porter-Leath, as it gives me, and other employees, the chance to interact with each other and watch as the Memphis community supports the thousands children and families we serve. 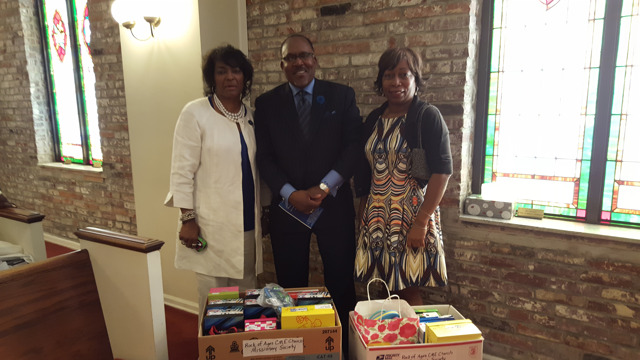 Porter-Leath has provided me opportunities to volunteer in outside community events to promote the Porter-Leath brand, as well as to attend various lunch and learns that have helped me in time management, data systems management, measuring impact and conducting internal self-assessments. Participating in these opportunities has allowed me to further understand how impactful our work is for the children and families we serve. During the course of normal business hours, most staff give back each and every day, as teachers, support staff, family services, home visitors, cooks and monitors. Just by coming to work, the entire Porter-Leath staff is educating, feeding, nourishing and assisting children and families to be their very best! In turn, Porter-Leath gives back to the staff by providing great benefits, opportunities to earn extra vacation/PTO hours, 401K matching, staff functions, extended casual days and Porter-Leath swag bags for those that are Leadership donors to the annual United Way Campaign. Working at Porter-Leath has been a great experience! I have been able to meet and hear about the experiences of so many wonderful staff and families. Throughout the changes and growth, Porter-Leath has always put its Values at the forefront of everything, because they want everyone to know that "We believe in accountability, earliest intervention, safest environment, teamwork, integrity, professional development and doing what we say." “We hold our managers accountable for the good and bad”. Those were the words spoken by then Human Resource Director, Sean Lee, during my interview over 13 years ago. He then followed it with the question, “Are you prepared for that?” I guess I answered the question correctly as I’ve been here since 2004. In that time, not only have I grown professionally, but I have also witnessed countless employees grow and move from volunteers and frontline staff to coordinators, managers and directors. Porter-Leath fosters our growth by trusting us to perform the duties in which we are employed. Oftentimes, agencies have missions and values printed on their brochures, simply because it seems like the right thing to do. Here at Porter-Leath, our mission and vision guide our work everyday. I definitely do not look at Porter-Leath as just a job, but a family. I genuinely love what I do and the people I do it with. Our atmosphere is “comfortable professional.” Yes, I made that up. It is the best way to describe it. We are professionals; however, we do not have to wear heels and suits everyday and we are not too busy to stop by our co-workers office to say, “How are the husband and kids?” That’s “comfortable professional” and that's Porter-Leath. If you’ve ever wanted to make a difference, have fun, and actually enjoy coming to work, you better fill out an application soon!